V-MODA sent the Geeks a sample of their Crossfade M-100 headphones with some interchangeable cables which included their SpeakEasy Mic, SharePlay Audio and BoomPro, CoilPro and 3-button cables. 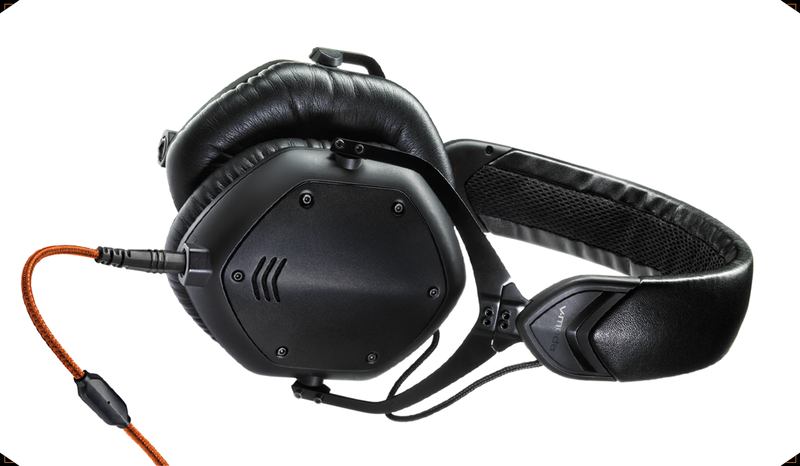 V-MODA crowdsourced the creative process to design the Crossfade M-100 headphones tapping into audiophiles, producers, editors and DJs to fine-tune the sound and ergonomics. We tested a black matte pair of the Crossfade M-100 over-ear metal noise isolating headphones. The visual design of the headphones are minimalistic and industrial with the matte black interchangeable aircraft-grade metal shields over each ear that include tiny matte black screws. The ear cushions are made from memory foam and are very comfortable to wear for even long periods of time. This is then attached to a black steel hinge that provides the “CliqFold” systems to quickly and easily fold up to a very compact size. Finally the “V-MODA” emblem is engraved on the top STEELFLEX headband, again in black. 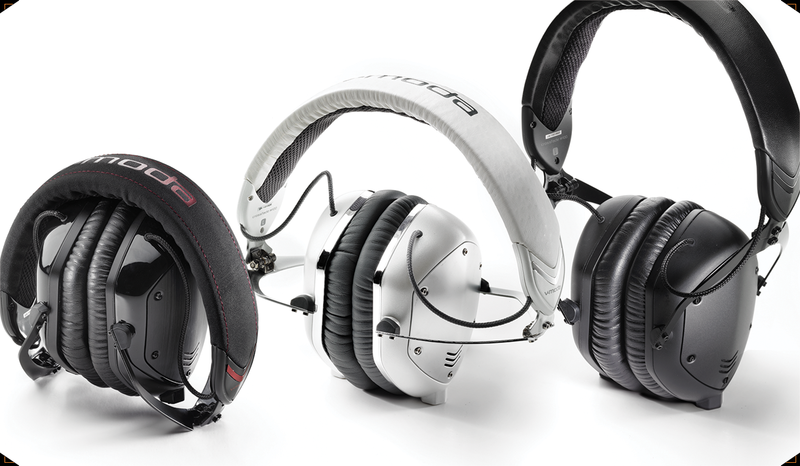 Rather than matte black, the Crossfade M-100 headphone’s base colors could also be shadow or white silver. The metal shields that cover the ears can be customized with color and laser engraved with text, pre-designed image or you can upload your own image. V-MODA says that the Crossfade M-100’s are “Inspired in Italy – Styled in Hollywood”… the headphones truly look incredible. The headphones include 50mm patent pending “dual-diaphragm” driver (inner and outer rings separate bass, preventing bleeding into mids and highs) with dual inputs at the bottom of each ear cover. The dual input allows you to either choose a side to plug a cable in or allows you to plug in two cables for mixing two sources at the same time or even daisy chain headphones with others. A very small but important detail is an included V-CORK that seals and protects the unused input port. Included was a SpeakEasyTM mic cable that has been specially tuned for voice recognition and calls in noisy environment with a button control which universally works with smartphones and tablets including Apple, Android, Windows, Kindle and Blackberry. 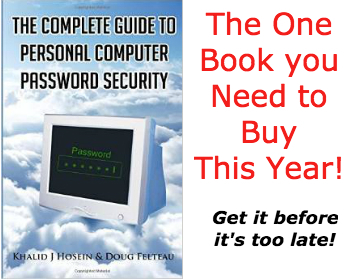 I was able to test the mic cable on multiple occasions including WebEx and GoToMeeting’s using my computer as the audio source as well as Google Voice from an iPad and Android phone with only excellent reviews of voice quality from the mic cable. We also tested the SharePlayTM audio cable that allows you to share your music without any additional adapters. You can also use this to DJ tandem. The SpeakEasyTM mic cable was even able to work while boarding a plane with announcements from the crew overhead. While not able to completely block out the overhead noise, the person on the other end could follow the conversation which is not often the case with other high end headphones with mics. V-MODA really put effort into the quality of the product. In fact, V-MODA tested the headphones against the MIL-STD-810G testing methods to provide military-level quality. The STEELFLEX headband can bend flat 10+ times, survive 70+ drops on concrete from 6 feet (10x industry standard), the kevlar-reinforced cable/plug can bend over 1 million times (100x industry standard). The Crossfade M-100’s can stand up to high and low temperatures, humidity, salt spray and UV exposure. The M-100’s come with a small exoskeleton case which house the folded M-100’s as well as a V-STRAP system inside the case that provides a bungie cord to hold your cables and even a USB flash drive. The case includes a carabiner to clip your headphones to the outside your bag. I only had one real issue with the V-MODA Crossfade M-100s and that’s when I allowed my 7-year old to play with the headphones. Her tiny fingers ended up getting stuck in the CliqFoldTM hinge while attempting to fold up the headphones. Unless you are buying these headphones for your pre-teen, this is probably not an issue you should be worried with though. With that said, what do the V-MODA Crossfade M-100’s sound like? 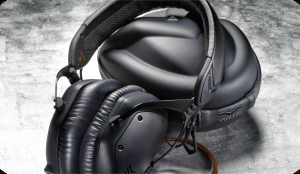 In a word, they sound “outstanding.” As mentioned, V-MODA crowdsourced the creative process from the audiophile community to get the sound right. I was really blown away that there was no artificial processing or batteries to create a clear and powerful sound, none was needed… in fact, make sure you have all artificial processing from your devices turned off for the clearest sound. I have quite a headphone collection and the V-MODA Crossfade M-100s are my favorite over-the-ear headphones and my go to headphones I use for Google Voice or Hangouts, GoToMeeting and WebEx conferences where I use my mobile devices or computer as my audio source. The V-MODA Crossfade M-100s are my choice to listen and enjoy music as they present the music in the cleanest and clearest form better than any other headphone I’ve sampled. V-MODA Crossfade M-100’s can be purchased and customized directly from V-MODA for $310 (additional $25 for customized shields) or you can purchase for $299.99 from Amazon. What’s The Difference Between an iPad and an iPhone? My 12 Favorite Apps for the iPad that Rock! Will Gmail’s Priority Inbox Work?